Now is the time to turn your life around! Wake up and live your dream TODAY! 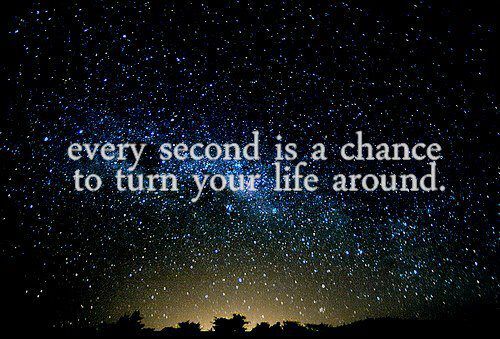 Every second is another chance to change your life. The key is that if you can change your mind, you can immediately change your life. In other words, your perception is your reality. Scripture to support this is found in part A of Proverbs 23:7, which states: For as he thinketh in his heart, so is he. Therefore, the more you improve and fine tune your thought life, the better life you will live as you consciously think and speak the reality you desire in your heart. Now is the time to Dare to Remember Every Amazing Manifestation! The reality is that your dreams already exist in the heart of God before they came to you and now they are just waiting on you to manifest them into reality! Someone out there just did a double take and re-read the previous sentence. What? Still not convinced? Let’s discuss this further with the only person who can truly convince you–YOU. Here’s a great question that only you can answer: What is your greatest dream? And now for the follow up question: How far are you between you and that dream? Answer to the follow-up question: As close as you can think it to be possible. Sometimes we unintentionally sabotage ourselves or delay our dreams because we (out of the fear of success) will find other things to do that would be easier than to set our mind to create the opportunity to live the dream. Notice there is no mention of chasing or running after the dream. That’s self-sabotage as well because why should you chase after something that you can think into existence right now and take steps right now to achieve? Take a pause and get a notebook that you can designate specifically for your dreams. Write down everything you have ever wanted to do. Now, as you continue reading let’s consider the fact that God would not allow those dreams to come into your heart if they were not meant to come true as He already knows the desires of our hearts. Nothing is impossible for Him; therefore nothing is impossible for YOU. Your dreams are not a far away notion. They are here right now ready to manifest. The only thing standing between your dreams is not money or any person. The only obstacle is your focus. Shift your focus today as you read this and change your life right now. Your thoughts can bridge the gap between dreams and reality. Go back to your list. Number each one in the order in which you would like to achieve them. Turn the page and literally map out your plans to achieve each goal. Don’t know how? Google it. Get help. Get motivated to keep moving forward into your reality through the shift in your perception of the world around you and your ability to achieve. Set some dates and deadlines. Prepare. Believe. Achieve. To love is also to trust. Trust yourself and trust God who works in and through you enough to believe that all things are truly possible as long as you actually believe–then believe and keep believing and enjoy feeling the joy with each success leading up to the reality which will be the manifestation of dreams that are in your heart right now. My testimony: Many writers compose their material based on experience. In my journey of mastering many universal laws, with the help of my parents, pastors, wisdom-filled friends and a great life coach, Kathy Hadley–I am learning that I have actually been applying the laws of attraction and manifestation since the days of my childhood. My parents would always say to me, “You could do anything you put your mind to”. I took that literally and became a master overachiever before I graduated from middle school when I started living my dreams of being on television in the sixth grade when my class was on Good Morning America, and being a public speaker among other things by seventh grade. By high school, I was getting big breaks into the media industry not long after being on WTVD-11 as the valedictorian of the Weldon High School class of 1992 on their “Best of the Class” segment, where I later interned, and by college I was already working in television stations and speaking to audiences at universities and corporate settings. Then life really happened right in the middle of my dream that I was actually living. I married my childhood sweetheart, had his child, and was separated all in a little less than a year’s time. Divorced by the second year. Devastated yet determined to stay positive for the sake of my little one who I had to raise on my own, I put my dreams on a back burner like none other. My focus was on getting an MBA and working my business as supplemental income while working full time to make sure my daughter’s needs were taken care of. I put my dreams on hold, suffocated them, suppressed them and everything else you could ever imagine–unintentionally. Then my father got diagnosed with vascular dementia and my world changed again. More dreams delayed as my focus was on the continuity of my father’s healthcare while taking care of my own daughter. By this time, I had locked away all of my writings in boxes, including my dream journal that I started when I was in college. I thank God that I had written them down. During my “awakening” over the past two years, where I have begun to pay attention to what I want out of life after tending to the needs of everyone else around me for about a decade nonstop, I opened boxes of writings and read my unpublished and published poetry, articles, and book material “stop-starts”. In those very moments, my dreams woke me up and backed me into a corner as if to say, “we shall manifest NOW”. I felt the energy in my writings. I felt the presence of the energy of my former self trying to recharge the present-day newly awakened “Me”. That was the day I decided to truly get back to loving “Me” and seeking to find the balance of sharing myself with those I love with boundaries so I don’t forget about “Me” and my dreams anymore. My awakened thought life changed my life. One day, shortly thereafter, I got a call from someone still wanting me to host a television show that I had in my mind determined I just “didn’t have time to do” and kept putting off communication with the person–unintentionally. That person never gave up on me. I also felt as if in that same instance, my dream never gave up on me. So now, I’m living my dream of being a television show host and now I’m working on some of my own projects that I have been putting off. I was and still am so thankful for that awakening. It inspired me to get back to everything I started doing years ago with the determination to see them through 20 years later. Ironically, I am also winning at attracting the right mate into my life. God granted me grace the first time and blessed me with a child–the only beautiful fruit of the failed marriage. Now I am experiencing the greatest victory of all: a refreshing and exciting new lease on LOVE through FAITH which can only yield a true marriage union that will endure and last a lifetime. Many other opportunities in television, marketing and media keep coming my way and I’m attracting all the right things and people into my life. I am just in a perpetual state of thankfulness. So believe me, I’ve been there and survived several storms that at some points actually arrested my dreams. The key to unlocking them was within me. I had to go within to let my dreams free. I share all this with the hopes of sparking the light inside each of you and to encourage you to never give up on your dreams, no matter how old you are or no matter how difficult present situations may appear to be. They are only illusions and distractions to keep you from the precious promises of God. He wants to give you the desires of your heart but you must first be awake to believe and live your dream. A good word, Toy, thanks for sharing! I love this post. I realized some years ago that I, too, had been aligned with Universal Laws long before I knew their name or that they actually existed. Thanks so much for your feedback, Kathy!! You are most welcome! This is such a wonderful feeling. Since we were predestinated before the foundations of this world, isn’t it awesome to have comfort in knowing we are flowing in tandem with a destiny filled with perpetual joy and peace! Thanks for helping me with the key of realignment and understanding what to do when I feel out of the vortex of perpetual joy and peace (God’s perfect will)! Thanks so much. So happy you enjoyed it!